The Planck likelihood code (PLC/clik) and parameter chains are available from the Planck Legacy Archive. The Planck lensing and Bicep-Keck-Planck likelihoods are included with the cosmomc installation and do not need to be installed separately. The Planck 2018 likelihoods (except for lensing) are not published yet. These instructions refer to the 2015 likelihoods. Note you need to use ifort 14 or higher to build CosmoMC, or gfortran (gcc) 6 latest (easily available for testing in virtual environments) so make sure you have that configured before you start. (CosmoMC will look for files in ./data/clik/hi_l, ./data/clik/lowl_l, etc etc.). You can now build cosmomc by running "make" as described further in the ReadMe, and it should detect and link to your PLC (clik) installation. to see if things are being loaded and calculate a test likelihood OK.
Planck provide a set of parameter chains produced by CosmoMC, available for download here, by default the 2018 results. (The US site has 2015 results). 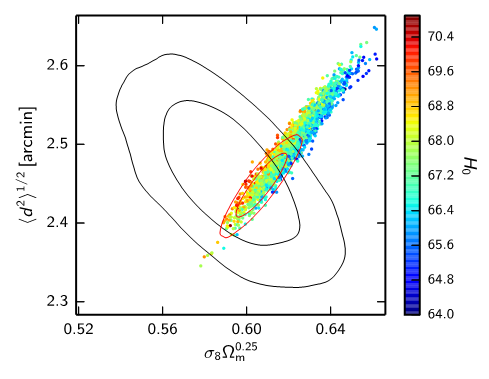 You can use CosmoMC's python scripts and getdist to analyse and make plots from them. Check you have set the PYTHONPATH as described at the top of the Python readme. Then download and extract all the chain data. Make a symbolic link from ./cosmomc/PLA to the location of the chains, e.g. (this step is also done automatically if you open the grid directory in the GetDist GUI). You can now use python, grid and plotting scripts on the PLA directory, and they will know about the available data. Grid configuration settings for the Planck parameter grid are in PLA/config/. If you download multiple Planck chain bundles, extract them to the same location so new folders are just merged over the existing ones and run makeGrid.py again, then plotting scripts etc will find all the results. If you want to use the +BKP tensor chains, download and add them last, so the config folder matches that in the BKP download. You can also configure the plotting scripts to use the PLA location as the default_grid_root (esp. if you want to run or adapt sample plot scripts under batch3/outputs/). Make a text file called python/getdist/config.ini (or set the environment variable GETDIST_CONFIG to point to a config.ini file somewhere else) and add setting lines to the config.ini file as required,e.g. The cache_dir is used to cache python-format chains, which makes loading them much faster after the first time. By default, plots go into ./outputs directory under cosmomc. You can se the output_base_dir to another location is where plot output (e.g. pdf) files are put by default (in output_base_dir/outputs). You can use the GetDist GUI to load the PLA folder location and then open and plot chains as you wish. Or you can write your own python scripts to plot things of interest; many examples are in batch3/outputs/ (for 2018 chains) and batch3/outputs/ (for 2015 chains). Make sure you have set up your python/getdist/config.ini as described above with default file location. to reproduce the figure above. (assuming you downloaded and installed the full PLA chain grid; default output location is ./outputs). For instructions on writing plotting scripts, or how to calculate new derived parameters, see the plotting and analysis scripts readme.